On a beautiful Spring day in Palo Alto this Saturday, April 14, EV owners offered test drives and showcased their vehicles to attendees of the 2018 Earth Day Festival in Palo Alto. The event was put on by Acterra, a Palo Alto-based group that brings people together to create local solutions for a healthy planet. As an Acterra EV Ambassador, I brought my Kinetic Blue Bolt EV, and was joined by owners of Nissan LEAFs, Volkswagen e-Golfs, BMW i3s, Fiat 500Es, Teslas, and other popular electric vehicles. I was one of the folks who left their car parked, and had many interesting conversations, answering questions and demonstrating features of the car, while helping people understand how much fun it is to drive an EV, and how we deal with their few shortcomings. My car (the Blue Bolt EV) was first in line of the staged vehicles, next to a VW e-Golf and Nissan LEAF–two direct competitors. We owners had fun chatting when no visitors were around. Everyone has a story. The VW e-Golf next to my car was a late ’16, so the lease deal was amazing, after a significant down payment, just $75/month!. The white ’16 LEAF behind it, owned by my friend Greg, was purchased used, at a significant cost saving over a new one. And that’s a good example of how to get into EV driving without a huge initial outlay. Not only were cars on display, but a number of them were also available for test drives, as seen by the orange Bolt, black BMW i3, and silver 2018 Leaf driving through the area in the photo below. This gave attendees a chance to get behind the wheel and viscerally sense the smooth, quick, quiet EV benefits. There were three Bolts available, as well as the two stationary ones, so we were well represented. There were information booths, including Acterra, charger manufacturer ChargePoint, and the City of Palo Alto. I spoke with Hiromi Kelty, City of Palo Alto Utility Program Manager, who told me that 20% of Palo Altans drive EVs compared to 3% statewide. She also told me about the EV Charger Rebate that organizations in Palo Alto can receive when they install EV chargers – up to $30,000. For more information, go to cityofpaloalto.org/electricvehicle or call (650) 329-2241. I showed my car to dozens of people, and had some interesting conversations. I allowed one 6-foot-5 man to adjust my seat, steering wheel, and mirrors to see if he fit in the car and could see if he was driving. The good news is that he did fit! The bad news is that it took a while to get my driving position back to normal. But I was glad to do it. One man, who was sharing rides in his new Tesla Model 3, brought along a battery-powered skateboard. At $1,500, it an expensive toy, but could be useful for traveling between mass transit and your workplace, or for good clean fun. I declined a test ride. When the session was over, around 1:30, we put away our signs, folded our tents, and drove our EVs home. It felt like a worthwhile experience. I only hope that someone we spoke with will decide to get their own EV. For 2017, I decided to focus my attention on hybrid and plug-in vehicles. Over the 12 months, I tested 35 cars, of which more than half – 20 – were either full EVs, plug-in hybrids PHEVs), or hybrids. About half of the cars were hybrids, and a quarter were EVs or PHEVS. This was a big change, as for the last 25 years, I’ve driven a car a week (52 a year). My EV focus was enhanced when I began submitting content to www.cleanfleetreport.com in addition to my newspapers in 2016. I also rejuvenated this blog, which I had originally filled with impressions of the Fiat 500e that I borrowed for the first quarter of 2016. The centerpiece of this new EV emphasis was my 2017 Chevrolet Bolt, which I leased on January 8 and have put nearly 10,000 miles on over the year, much of it during those weeks when I wasn’t driving a test vehicle. I also ventured into covering events, including National Drive Electric Week, during which I hosted an event at my office and I attended two other ones. At the Cupertino NDEW event, I met Greg Bell, who introduced me to Acterra, an organization that promotes EV use and other environmental efforts. I attended two Acterra events where important speakers delivered valuable content, which I captured in two articles that appeared both in my blog and in Clean Fleet Report—and on Acterra’s website as well. At the end of the year, I sampled Gig Car Share, a ridesharing service that uses Ridecell software. While reading An Inconvenient Sequel: Truth to Power, Al Gore’s second book (and movie), I saw a story about a man who changed careers in order to work in the green industry—and learned he was local. I later met with Wei-Tai Kwok over lunch and toured his company, Amber Kinetics, which manufactures energy storage devices. I plan to continue my green vehicle and industry focus in 2018, with additional expansion into anything that contributes to a greener future—interviews, research, and more vehicle drives, of course. Here’s an alphabetical list of the EV and hybrid vehicles I tested in 2018, with brief summaries. Note: These stories, except for a couple that aren’t written yet, are available on Clean Fleet Report. Acura MDX Hybrid – A big cruiser, this car has significantly improved fuel economy, an incremental improvement over the regular gasoline model. BMW i3 – Still odd looking (it grows on you), this car is a pure EV, but can be had with a small “range extender” gas engine. My tester had the extender, but I never used it. The ’17 upped the estimated range from 72 to 114 – a much more useful proposition. 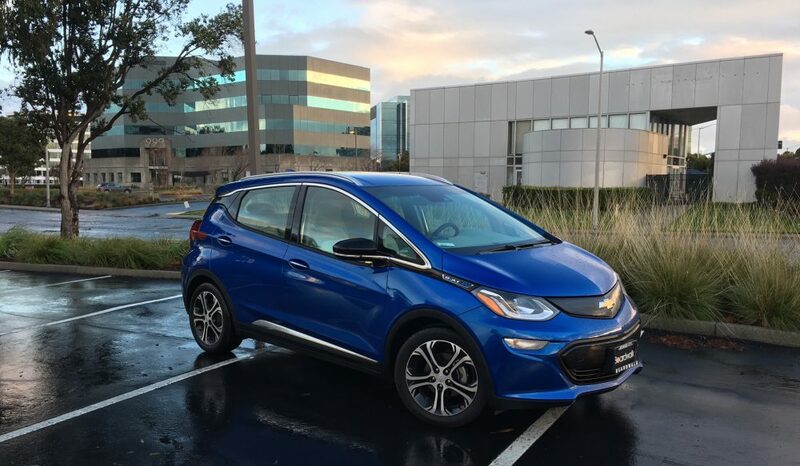 Chevrolet Bolt EV – The Bolt is the first “affordable” pure EV with a truly usable 238-mile EPA range. I love mine, and have achieved more than 200 miles of range with no problems, other than an occasional glitch to the entertainment system (which recovered automatically). Motor Trend’s Car of the Year, among other honors. Ford C-Max Hybrid – This European design is a comfortable and usable car, but lost some favor when its initial fuel economy numbers turned out to be overly optimistic. Its EPA numbers are 42 mpg overall, about double what the gasoline version of its sister vehicle—the Fusion—gets. The Energi model, which I didn’t test, has a plug and a larger battery for local all-electric motoring. Ford Fusion Hybrid and Energi – This handsome sedan uses the same drivetrain as the C-Max, and offers both hybrid and Energi (plug-in) versions. I tested both. The hybrid averaged 41 mpg while the Energi got 101.4 MPGe, using nearly no gasoline at all. Honda Clarity PHEV – This plug-in hybrid sedan is a brand-new effort from Honda. Initial impressions (I’ve had it two days) are it’s handsome on the inside, despite plastic wood trim, but a little weird on the outside. I got 43 miles of range with the initial charge, which was enough for a Saturday’s worth of errands. The Clarity also comes as a hydrogen fuel cell version (I drove it briefly at an event), and a full EV version with a disappointingly small 89-mile range. I plan to test these other two Claritys in 2018. Hyundai Ioniq – I drove the full EV and the Hybrid versions of this all-new car. If you want a Prius or a Leaf but hate the wacky styling, this is your car. The EV has a stellar EPA rating of 136 MPGe combined. A plug-in hybrid is due in 2018. Kia Optima PHEV – This handsome large/midsize sedan has a 27-mile EV range, so I used no gasoline all week to commute. Only when I ranged further did I dip into the tank, so I averaged 99.9 mpg during my test week. Kia Niro – This attractive and right-sized crossover makes sense as a hybrid, and is now coming out as a plug-in hybrid. I drove the entry-level FE and top-of-the-line Touring. I got 43.8 mpg in the Touring and 48.2 mpg in the FE. There was about a $7,000 difference between them. A pure EV version would be a game-changer. Lexus ES 300h – This traditional sedan adds a bit of luxury to the hybrid package. I earned 33.1 mpg during my test week, a bit below the EPA estimates. My option-packed tester listed at more than $48,000. Toyota Camry Hybrid – I drove both the 2017 version and the all-new 2018 model. The ’17 scored a disappointing 28.9 mpg, but the ’18 hit 37.9 mpg, and is all-new, inside and out. Toyota Highlander Hybrid – Toyota put its hybrid platform under a family-size crossover, and added some efficiency to it. I averaged 25.0 mpg; the gasoline model I tested a few years ago hit 20.6, so that’s a nice improvement. Toyota Mirai Hydrogen Fuel Cell – Odd looking, but drives like a nice big sedan, although it’s not as big inside as it looks. Essentially an all-electric car you never plug in, you do need to fuel it, and hydrogen fuel is pricey and hard to find! But, if you lease one now, Toyota picks up your fuel tab for the three-year term (up to $15,000). Toyota Prius Prime – This is the plug-in version of the latest Prius, and it slightly tempers the radical styling front and rear. Its 25-mile range is useful for all-electric commuting, while its hybrid personality lets you drive wherever you want to with no problems. I averaged 70.5 MPGe during my test week. Toyota RAV4 Hybrid – As a compact crossover SUV, the RAV4 is positioned at the center of the car market now. As a hybrid, it has 28 percent better fuel economy numbers than its gasoline version. VW e-Golf – The Golf is a wonderful driving car, but the original e-Golf’s range was a paltry 83 miles. The new one, with minor styling enhancements and larger battery, is boosted to 125 miles, which is much more usable. These are the events, interviews, and services I covered in 2017. Western Automotive Journalists Media Days – This writers group, which I co-founded in the early 1990s, has a wonderful annual event that combines on-road driving, a day at Mazda Raceway Laguna Seca, and a festive banquet. Auto scribes and manufacturer representatives connect and renew their assocations. I tested a number of EVs at this event and as always, had lots of fun. Brett Hinds (Ford) interview and Third Industrial Revolution screening – Ford Motor Company sponsored a screening of Third Industrial Revolution, a film based on the book by Jeremy Rifkin. The film features Rifkin himself making the important points of this visionary tome to a young audience. Hinds is the Chief Engineer for Electrified Power Systems, and in our 1-on-1 interview he described what Ford has planned for the future. National Drive Electric Week – This annual event’s purpose is to expose more people to the virtues of electric motoring by having owners show off their cars. As a Bolt driver, I hosted one at my company during the week, and attended two Saturday events, where I participated and networked like crazy. Sponsored by Plug In America, the Sierra Club, the Electric Auto Association, and the Nissan Leaf. Silicon Valley Reinvents the Wheel – This annual event, cosponsored by the Western Automotive Journalists and the Autotech Council, is jam packed with speakers, booths, cars, and a lot of excitement. It’s a great place to network and learn what’s coming. Opening of New Hydrogen Station in San Ramon – Hydrogen fuel cells in electric vehicles are an exciting but complicated technology. A big issue is infrastructure, so the opening of station #29 (of a planned 100) is a step forward. I used this station later when I tested the Toyota Mirai. Steve Westly Acterra event – The former California Controller had a lot of positive things to say about the growth of sustainable power generation and the rise of EVs. Carl Pope Acterra event – On his book tour for Climate of Hope, which he co-wrote with Michael Bloomberg, Pope spoke of the many challenges and successes of the move to a sustainable energy future. Gig Car Share test – I heard about Gig Car Share while researching Ridecell, and sampled a vehicle while I was out getting a haircut. If you only need a car occasionally, it’s ideal. Just download the app and you’re on your way. And the cars have bike racks! National Drive Electric Week (NDEW) is an annual celebration of electric cars, which has grown larger and more popular each year since its inception in 2011. This year, NDEW ran from September 9 to 17. I attended three events—one of them hosted by me. The photo above is from that event, at my workplace (photo: Candice Tandiono). I’d always wanted to be part of this, but it wasn’t until I actually had my own car–a 2017 Chevrolet Bolt–that I felt I belonged. Please read my report, published in Clean Fleet Report. I picked up my Bolt EV last Sunday, but really just drove it home in the rain. I’ve commuted all week, but this was the first weekend to really stretch out. And the weather was dry. (Above: 2017 Bolt with 1965 Eichler house. I lived there as a teenager). I filled up my battery on the ChargePoint Level 2 chargers at work on Friday, then drove home. With 177 miles available (middle number on the left, I felt confident. Saturday morning was local errands–the auto supply store for new car washing tools, the florist, and the health food store. Then, I took my wife out to lunch. Normally, we park right behind the restaurant, but this time, we parked three blocks away so I could use the charger. I didn’t mind–it added steps for my Fitbit–one of the many things I plug in to charge these days. It was Blink Network station, and I was unhappy to find that my card didn’t work! It has been a while, I guess. I ended up using the guest method, with its convoluted method of sending you a code, but I had to pay Guest prices. I later found out that if I used the app on my iPhone (which I already had) I could have done the same procedure, but gotten the member rate. I ordered a new card, just in case. The charge pushed me up to 184 miles. At the Blink charger, I met Wayne, a Leaf owner who was fascinated by my Bolt EV. Finally – an eager person to talk to. Of course that’s what we early owners want, isn’t it? Next, I drove 33 miles eastward to visit an old friend who was having an 80th birthday celebration. I kept it to 65 mph and drove mostly on the freeway. The range dropped 24 for the 33-mile trip. After that, I drove south for about a half hour to hear my friend and his daughter play some Jazz. That trip flew by, too, with the Bolt EV at night showing off its colorful screens and cruising near silently down the freeway. After the show, I drove home. My 94-mile trip in the afternoon and evening showed a 91-mile change in the range. This is good to know, since I plan to make other freeway trips, and the numbers are pretty accurate so far. I put my car on the slow charger at home, since my new level 2 home charger isn’t installed yet. But, it didn’t add more than about 25 miles overnight. I learned today from one of my new friends on the Chevy Bolt EV Owners Group Facebook page that I need to move my charging amps from 8 to 12. That’s supposed to double the charge. I did it, so we’ll see! I’ve been following the progress on my MyChevrolet app. Sunday’s adventure included my first use of Apple Car Play. It works wonderfully, with big, bright screens for the navigation I needed and for playing music from Spotify. I also sent a hands-free text message using Siri. Plugging in my phone and tucking it under the armrest makes it an out-of-sight out-of-mind experience. I did notice that the screen in the car allowed a lot of functions, including searching for types of destinations, but didn’t let me enter a specific address. For that, I had to use the phone itself–presumably while parked, before starting out. Must be a safety feature. On the way home, I stopped at Whole Foods, thinking I’d hang out and use their fast EVgo quick charger. But there was a car parked there, so I pulled into the only Level 2 spot there was. I walked over to look at the quick charger. I discovered that some jerk had parked his white second-gen Volt in the spot–but wasn’t using the charger! How RUDE. I had about 50 miles left, so it wasn’t an emergency. As I pondered this state of affairs, a guy pulled up in a black Fiat 500e, hoping to charge up. He parked in a non-EV space and came over. He’d only had his car for a week (like me), but had no EV experience. He’d set the Fiat to charge overnight but the car didn’t cooperate, for some reason. In any case, 500e’s don’t have a quick charge socket, so he wanted a Level 2 slot. I decided that he needed it more than I did, so I told him to pull around and gave him my spot. I felt I had to make up for the goofball who parked in the Quick Charge spot without using it. After making a small indentation in the false floor panel in the rear area a couple days ago, I decided to protect the entire cargo area. I bought a workout pad at Big 5 for $19.95 and cut it into shape for my hatch area (with seats folded down). Now I can carry my musical gear without damaging the surface. Besides smelling a little odd, it did a great job. Wrapping up this rambling monologue, I had no problem with range–my biggest goal with the Bolt–and enjoyed lots of very pleasant driving all weekend. I used all three major charging companies in the S.F. Bay Area, and my house, too. The Bolt EV is turning out to be everything I’d hoped for. My only regret is that I didn’t get around to washing it yet.